KarmaHub describe themselves as a “machine learning labeling service.” That means they help companies improve the quality of their self-learning artificial intelligence systems. It sounds very complex (and it certainly can be), but if you do a rough translation of the technical jargon, you'll discover that their main line of business is actually internet evaluation. They're essentially a competitor to companies like Lionbridge and Appen. There have been a lot of questions about this company popping up in work-at-home online communities lately, so we decided to do a little research, and see what we could dig up about them. At the time of this writing, there's very little information available on KarmaHub's website that's geared for prospective employees. There's no worker FAQ or anything along those lines. For that reason, I had very little to work with when I started researching this article, and ultimately had to piece the story together partially through scouring various corners of the web, looking for scraps of info wherever I could find them. I was fortunately able to glean a lot of useful data just by looking at the pages where KarmaHub advertise to prospective clients. Three of the services they offer on their website are internet analysis, sentiment analysis, and image analysis. These are exactly the sort of tasks an evaluator might be asked to perform. From the description on the site, sentiment analysis is putting a sentiment label on a Facebook or Twitter post to describe the mood or intent of the poster. Image analysis is tagging images for relevancy or accuracy. So, for instance, if a user searches for images of horses, and gets an image of a dog instead, that would need to be flagged by the evaluator. Image evaluation tasks, can, of course be more complex than this example, but that's the basic idea. Internet analysis sounds like your standard search engine evaluation. Basically it involves making sure the search results in a list match the query, but the rules can get fairly nuanced. A lot of times you'll be drilling down to more subtle differences between individual search results, and ranking them based on which is the most relevant. In addition to the information I was able to get from their client-targeted pages, there are a few generalized things we can say about search engine evaluation jobs that apply to most companies. First, the jobs tend to change a lot on a week to week basis. New tasks are introduced, and new quirks are added to old tasks which require you to alter your approach. Second, there's almost always an emphasis on confidentiality – the big search companies don't want their data shared publicly, so you will probably have to sign an NDA as part of the hiring process. There may also be rules against working for any of KarmaHub's competitors, at least while you're under contract. As for the work itself, in most cases, you spend your days examining web search results, images, advertisements, and social media posts. Then you use check-boxes, drop-down menus, and other kinds of widgets to express an evaluation based on whatever set of criteria you've been given. It's kind of similar to taking a multiple choice test. According to my research, the starting wage is in the range of $10 to $11 per hour, and may vary a bit depending on the exact position you're hired for. From comments on the web, there seems to be a fair degree of flexibility in regards to scheduling, but they will want you to work at least 20 hours per week. Able to work independently from home. Responsible and able to complete tasks as defined in task requirement document in timely manner. Has been an internet user for a long time and is familiar with the many websites that are popular. Ideal candidate have a curious/investigative mind, understand and enjoy problem solving. Asks questions without being prompted and want to know more. Regularly and consistently works part-time or full time hours per day. Have a laptop or desktop with high speed internet connection and anti-virus software. Contracting Conditions: Part-time (you must be available for a minimum of 20 hours per week), Independent contractor agreement. 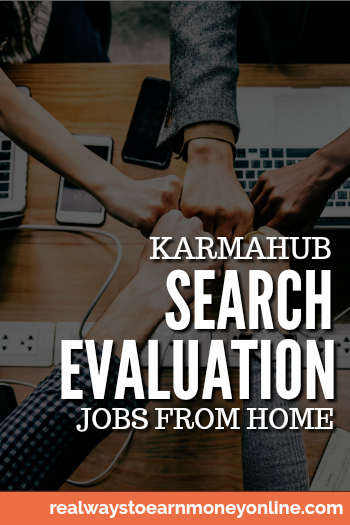 To apply as a KarmaHub evaluator, just send your resume to the appropriate email address (I've provided it for you at the end of this article, in the “how to get started” section). If KarmaHub is interested, they'll contact you to schedule a phone interview, and you'll have to fill out some documents. Then you'll go through a fairly meticulous training process, and at the end they'll put you through a trial-run on the actual system to make sure you know what you're doing. Unfortunately, there is almost no feedback regarding KarmaHub on any of the normal job review sites. Glassdoor has a single one-star review – the low rating is owed to the fact that management apparently failed to communicate with this individual after hiring him or her. There is also a thread about KarmaHub on the Reddit /WorkOnline site, you can read that here. In those comments, one person did say they were paid. We've additionally had some people in our work at home Facebook group get hired by KarmaHub. I also had a reader email me to let me know he'd been hired by them over the summer and was paid. According to this reader, KarmaHub has a strict NDA and does not want a lot of their info out there. They also won't allow you to work for competing companies like Appen or Lionbridge while you work for them (as is typical with search evaluation companies). Unfortunately, KarmaHub does ask for quite a bit of personal information when you apply according to people who have looked into them. While this doesn't make them a scam, and there are other work at home companies who ask for similar information, this is still nothing we recommend giving out if you don't feel completely comfortable with it. If you like the sound of this gig and want to give it a try, just send your resume to jobs@mykarmahub.com, and wait for their response. According to most of my research it sounds like they'll contact you within a few days if they're interested, but that could change at any time for a variety of reasons, such as a slow-down in hiring. If you don't get a fast response that doesn't necessarily mean they won't hire you later.